Whether winter has been mild or harsh, my family is always ready for Spring! There’s plenty of family fun in April as the festival season gets started (it won’t end until November!) and outdoor activities fill our calendar. Pack your umbrella when you head out because our unpredictable weather generally continues until May. Follow our Easter Fun! board on Pinterest for lots of holiday ideas. 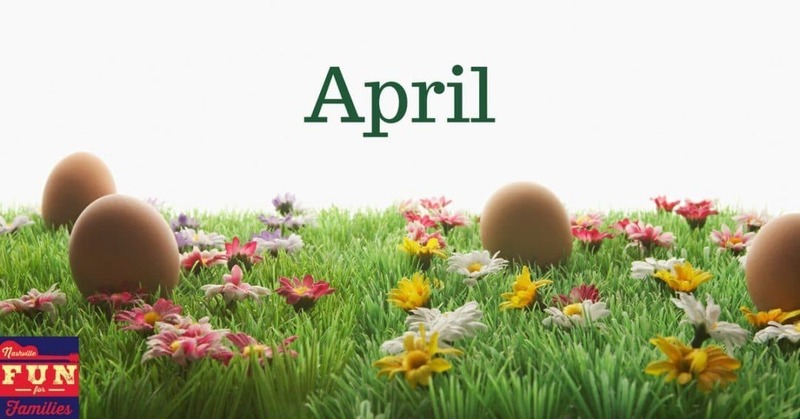 There is so much Spring and Easter Fun in our area this month. Find them all in our guide. Get some exercise and learn some history. April is a great time to visit Stones River National Battlefield. If we get a sunny day, spend some time at Shelby Bottoms Nature Center and Park.There are lots of events scheduled every weekend. You can find a schedule at this link. There are lots of festivals scheduled this month. Get out the GPS and spend the day in a new part of Middle Tennessee! This is the perfect time to make a visit to Lucky Ladd Farm. Your kids will love the baby animals and all the fun activities. Bring a picnic and plan to spend all day! Attend a Vintage Baseball Game. This unique organization plays games at historic locations throughout middle Tennessee from April through September. Your whole family will enjoy seeing the different uniforms and equipment. The best part? They’re FREE! If April showers dampen your spring plans, make the most of it by spending an afternoon at Hermitage Lanes. You can bowl a few games or just play in the arcade. Make a trip to Moss Wright Park in Goodlettsville. Play on the playground, have a picnic lunch and then wrap up the day with a tour of Mansker’s Station. Use our list of Free Spring Events to plan some frugal fun! Find an event to celebrate Earth Day throughout the month of April. It’s never a bad time for a trip to Monkey’s Treehouse. Spend a day at Stars and Strikes in Smyrna. Bowling, laser tag, an escape room and tons of arcade games all in one place! Get ready for summer camp! Find the perfect option for your child in our guide.